The photos showed clear blue skies, sparkling lakes, snow-capped peaks and — people in khaki uniformed shirts smiling. Memories of days on the trail in the Indian Peaks Wilderness overwhelmed me. All of this came up because as April has rolled around, I find myself interviewing prospective volunteers for this coming summer. 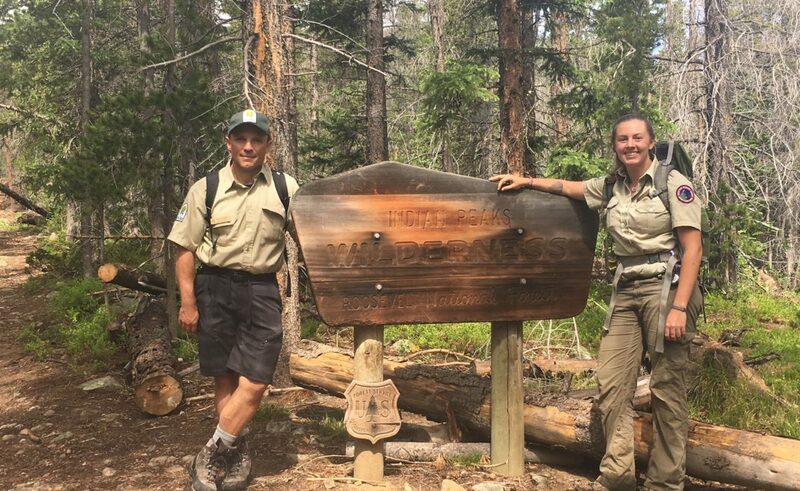 The Indian Peaks Wilderness Alliance partners with the U.S. Forest Service to provide representation on the trails. One of the busiest wilderness areas in the country, has very little staff out on the trails. That’s where Trail Patrol volunteers come in. No longer working for the Park Service, I find myself longing for nature. Despite that, it can be hard to motivate myself to get out their on my own. In fact, it can be hard to leave my Nederland home a lot of times. I love the peace and quiet, and working in Boulder, I find myself retreating to my inner sanctum on my days off. It’s easy to just shut myself off from the outside world. Living in the mountains can lead to a very isolated existence. Sociologists have done research showing that isolation is bad for mental health, and can even lead to a shortened life span. I know this and yet still it can be very hard to talk myself into getting out and about on days off. Making a commitment to something bigger than myself. Because if I tell someone I will do something, I will do it. I don’t want to let them down. Years ago, while living in California, I found this out first hand. Finding myself depressed, my life seemed mundane and not very fulfilling. I didn’t like my job. All I wanted to do was hide in my apartment and pull the covers over my head. That led to my first stint volunteering with the Humane Society as a dog walker. Every week, I donned my apron, snapped a leash on a furball and got out of my head. Slowly, my depression lifted and I started feeling better about me and my life. These days I still volunteer with the Humane Society as well as the Forest Service. Some days I still want to hide away in my log cabin. But I made a commitment to help someone or something else. And so I go out the door and I serve. Each time, I realize, though I think I’m the one doing the giving, I receive so much more. I feel happier, more content, and more grateful with my life. I’ve broken my isolation and become connected with something greater than myself. I love this, Leslie! It can be hard for me to get out of my head as well, let alone get out on the trail. But volunteering with the IPWA does give me a sense of purpose and of being a part of something bigger than myself. I’ve been so inspired throughout the interviewing process for volunteer registration, because I see myself in these people: loving the outdoors, but wanting to do more to help protect them. Can’t wait for the patrolling season to start! Reghan, I guess I should have given you fair warning that your picture was going to be on the blog. Glad you are part of the IPWA and looking forward to hiking with you this summer.